Since this post, we’ve added many new Personas features. The latest one is called SQL Traits — learn about it here. The best way to acquire, serve, and retain your customers is to better understand their interests and needs. You need to know which actions your customers have taken over the course of their relationship with your brand, no matter where these interactions happen. Ideally, each conversation should incorporate context from a customer’s past interactions. However, synthesizing this data into actionable insights is a massive data and infrastructure challenge. We’re here to help. Today we’re releasing Segment’s latest product to the world: Personas. Personas is now out of beta and generally available so you can treat your customers like people, not data points. Using Personas, our beta customers have already been able to drive a 50% lift in customer engagement, 10% reduction in ad spend, and 33% increase in ad conversions. Identity Resolution: Personas automates the manual process of resolving disparate event data across devices and channels. With the Segment Identity Graph, Personas intelligently merges user data into complete, customer-level profiles in near real-time. 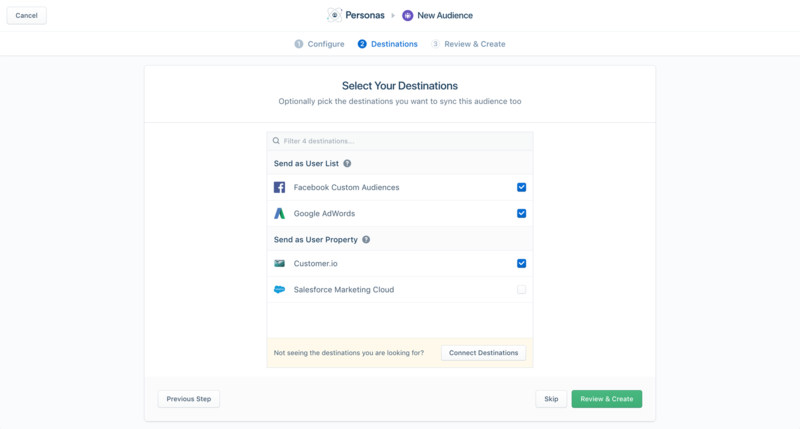 Activation: Lastly, you can sync Computed Traits and Audiences to your Segment Destinations with just a few clicks to personalize messages across channels, optimize ad spend, and improve targeting. You can also use the Profile API to build in-app and onsite personalization. No more uploading and downloading CSVs or querying frenzies to find the right audience to target. Personas enables you to build traits and audiences from your historical data that are continually refreshed as you learn more about your customers. Personas is compatible with all server-side Destinations as well as Facebook Custom Audiences and Google AdWords. Now that you know what Personas does, let’s dive into how companies are already using it to improve the customer lifecycle. From acquiring new users, to streamlining communications, and experimenting faster, Personas has become integral to many growth teams’ workflows. Here are use cases from a few of our early customers and the positive impact Personas has had on their businesses. Consulting.com, an online education platform for entrepreneurs, relies on Facebook for new user acquisition. However, they were limited by Facebook’s audience builder, which doesn’t allow for advanced event property and user trait filtering. 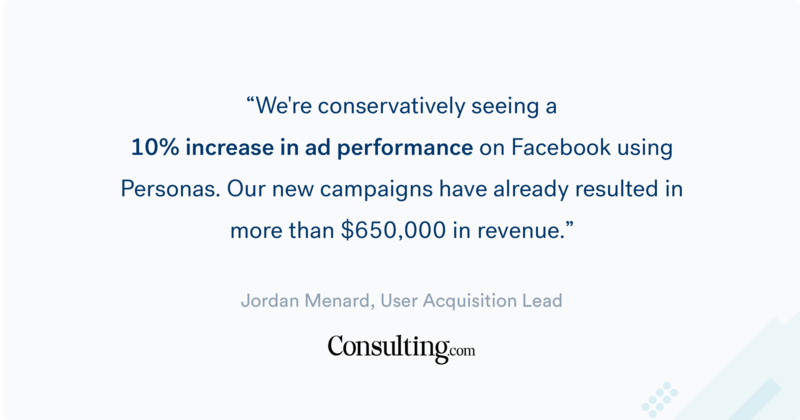 Using the Identity Graph and event-based Audiences, Consulting.com was able to build a seed audience of their best users and activate it in Facebook to build lookalike campaigns. Their new campaigns increased return on ad spend by 10%. Similarly, DigitalOcean, a cloud platform for developers and their teams, was able to improve their cost per conversion with Personas by an impressive 33% compared to Google’s in-market audiences. Frame.io, a post-production video collaboration software platform, used Personas to implement a cross-channel marketing strategy by syncing their audiences across each of their previously independent end tools for in-app messaging, email, and live chat. Building centralized audiences within Personas and activating them across a variety of tools ensured that each customer received consistent messages and improved Frame.io’s performance in those channels by over 50%. 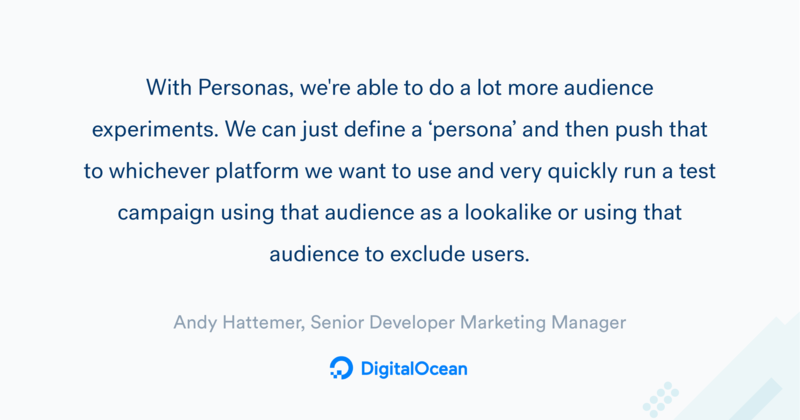 Personas enabled the user acquisition team at DigitalOcean to build new audiences based on high-value customer attributes 5x faster because they no longer had to pull lists from their analytics tools and manually upload them to their marketing tools. 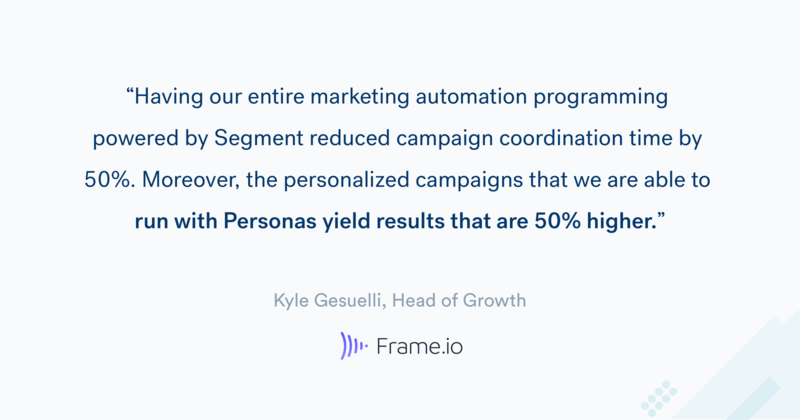 Similarly, Frame.io was also able to reduce campaign coordination time by 50% by activating traits and audiences to each end tool they used. What will you do with Personas? These are just some of the most popular use cases for Personas that we’ve seen to date. However, they aren’t the only exciting use cases explored during the beta. For example, in addition to coordinating their messages across channels, the Frame.io team also leveraged profiles in Personas to streamline their customer support function and decrease the resolution time for complex support tickets by up to 80%. Moreover, a number of customers have used their customer data in combination with the new Profile API to personalize their digital experiences with customer-specific product or content recommendations. We believe that putting customers first is largely a data challenge. We’re on a mission to provide the customer data infrastructure you need to remove the technical hoops preventing you from best serving your customers. Our core platform enables you to collect, organize, and distribute your first-party data. Personas is a huge step in helping you synthesize that data and make it actionable. Personas not only helps growth teams lower customer acquisition costs, increase lifecycle conversions, and provide a consistent experience, it also provides benefits across your organization. Support teams can more quickly resolve tickets. Product teams can personalize in-app and onsite experiences. Analytics teams can reduce query time with a comprehensive users table. Getting everyone on the same page about what is happening with your customers is a huge win in itself, as few companies ever agree on a single source of truth. Now that you have it, we can’t wait to see what you do with it. Ready to get started? Click here to request a demo of Personas. Or to learn more about how Frame.io used Personas to coordinate marketing messages across channels and reduce ticket support time, sign up for our upcoming webinar here.